CTAs in early 2016 have naturally captured the limelight by virtue of delivering their signature diversification benefits, and making money whilst most other hedge fund strategies, and equities, retreated. But institutional investors, which often have time horizons measured in decades (or theoretically infinite visions for endowments and foundations) do not predicate their multi-billion allocations upon a few months of performance. Much longer lookbacks explain why systematic and quantitative investment strategies now occupy the centre stage of investor attention. One of these categories, CTAs, now manages assets of $327.3 billlion in Q4 15, representing more than 10% of hedge fund industry assets of $2.79bn, according to Barclayhedge. CTAs have been particularly adept at satisfying investor appetite for ‘liquid alternatives’, as the liquid nature of the strategies makes them a good fit for many regulated fund wrappers. CTAs and quantitative strategies are constantly evolving. Many have branched out well beyond traditional trend following strategies, as reviewed by Societe Generale Prime Services in their 2015 market comment paper entitled ‘The Life Outside of Trend’. Investors should not equate quant exclusively with CTAs, as a variety of other partly or wholly quantitative strategies also run many billions. The rigorous analytical techniques that CTAs have honed and refined, over four decades, are increasingly being applied to wider investment universes, including over the counter (OTC) markets and single securities. In an ultra-competitive arena, the latest advances in artificial intelligence, ‘big data’ and technology are being harnessed by the systematic investment community. Systematica is among those managers in the vanguard of these exciting developments – in terms of both asset growth and the breadth of its offering. From its independent outset in January 2015, Systematica’s assets firmly secured its place as one of The Hedge Fund Journal’s ‘Europe 50’ managers (the largest 50 Europe-based hedge fund managers, measured by assets) – and the firm has gone from strength to strength, swiftly passing key milestones. In March 2016, Systematica’s assets reached the eleven figure level – exceeding the $10 billion milestone. Though assets remain dominated by the award-winning BlueTrend strategy, running over $8 billion, Systematica’s BlueMatrix strategy has grown assets to $1.5 billion, from $600 million, since the firm struck out alone, underscoring the wisdom of Systematica’s decision to build a diversified systematic platform. “This validates our decision to spin out and clearly indicates the appetite for systematic strategies,” says head of investor relations, Declan Ryan. Systematica spun out of Bluecrest Capital Management in January 2015 in order to exploit the surge of interest in systematic investing, and focus exclusively on systematic investment strategies, diversifying and developing its suite of systematic approaches. THFJ’s front cover feature on Systematica, published in March 2015, explored the many and various rationales for building a systematic investing powerhouse, which include tailoring research, product design, branding, execution capabilities and the technology platform to the specific needs of systematic strategies. Less than a year after Systematica broke away from BlueCrest, it attracted the interest of Affiliated Managers Group (AMG), which in November 2015 acquired part of BlueCrest’s residual interest in Systematica. This investment is a huge vote of confidence. As a listed firm, AMG is looking for recurring revenue streams and the stake indicates AMG’s confidence in the longevity of the franchise that Systematica is building. Indeed, Systematica CEO Leda Braga (who has featured in all four of The Hedge Fund Journal’s ‘Leading 50 Women in Hedge Funds’ surveys, in 2009, 2011, 2013 and 2015) mentioned the benefits of AMG’s experience in assisting with succession planning, an increasingly important attention point for institutional allocators as the hedge fund industry matures. After the AMG deal, Systematica remains owned mainly by its staff and partners, and Systematica staff invest in Systematica funds alongside external investors. The addition of Systematica to AMG’s portfolio of asset manager stakes can be viewed in the broader context of AMG’s conviction in the growth of systematic strategies. AMG also owns part of leading quantitative manager AQR, which runs $140 billion across long only and hedge fund strategies. Systematica has not yet launched long only offerings but intends to over the medium term. Systematica’s BlueTrend CTA strategy is renowned throughout the industry, and at some point we expect to revisit BlueTrend to take stock of how the programme is developing. On this occasion, however, we will explore the firm’s systematic, equity market neutral, strategy, BlueMatrix. The product manager for BlueMatrix is Gregoire Dooms, who joined BlueCrest in 2008 and worked his way up to become portfolio manager of the strategy. In contrast to directional CTAs, BlueMatrix is broadly market neutral with long and short books the same size. It trades around 3,800 stocks globally and aims to generate returns from single stock alpha, which today arises from predominantly fundamental signals whereas CTAs tend to employ mainly technical signals. Yet BlueMatrix itself began life in 2007 using only technical signals. One driver of its ongoing evolution was making the strategy more diversified and scalable. While statistical arbitrage can become capacity constrained, due to the shorter typical holding periods, BlueMatrix’s current suite of signals – with multi-day/week holding periods – expands capacity and improves the robustness of the strategy. The opportunity set for the strategy should thereforebe considered in the context of its continuing expansion. “Back in 2011 and 2012 we only used one source of alpha – mean reversion– and did not have the wide range of alphas we have today,” explains Dooms. 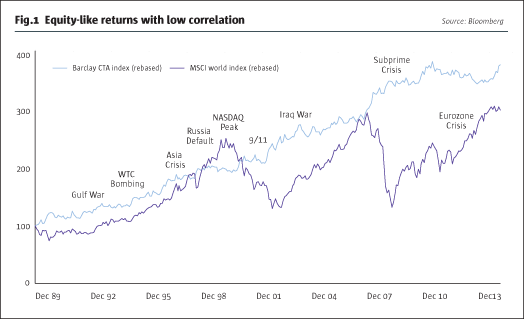 Additionally, the high correlations between stocks and within sectors post-crisis in 2011 and 2012 made it more difficult for stock-picking strategies to extract alpha. The explosion of dispersion between stocks, sectors and countries seen in 2015 has naturally been a gift for stock-pickers, as has increased investor risk aversion.“Periods of irrationality can be very good for the strategy as when people panic it creates dislocations that throw up very good opportunities,” reflects Dooms. As a market neutral strategy, BlueMatrix aims to be lowly correlated to equity indices and uses some leverage to magnify the performance differential between the long and short books. No single ‘bet’ or ‘theme’ is expected to account for much of the performance and the strategy keeps exposure to country, currency, industrial sector and market capitalisation factors within tight limits. Rather, single stock alpha extracted from multiple markets and sectors has steadily compounded over the months and years. “We are more diversified than some of our competitors” asserts Dooms. This is true in terms of exposures to 3,800 stocks (a number which should grow this year), many industrial sectors and a geographic reach including less widely followed markets such as Latin America, and Central and Eastern Europe. Perhaps more importantly, the diversity of BlueMatrix is also evinced by its wide spectrum of more exotic and esoteric alpha signals that do not fit into standard boxes. This conviction guides how BlueMatrix pursues its research. The disciplines and cooperative methods of academic research continue to guide the BlueMatrix research process. Post-Brown Dooms joined BlueCrest as a researcher in 2008, developing the BlueMatrix programme and steadily assuming more responsibility until he became PM, leading a team that is open-plan rather than siloed. “We have a matrix structure where all researchers collaborate on all products,” states Dooms. The protocol is that “the research team is run as one cohesive unit under one head of research. Every change to the model is done systematically after we have checked that the data backs the hypothesis and whether it has alpha or portfolio construction potential,” he adds. The relationship is symbiotic with BlueTrend research, also yielding insights used by BlueMatrix. For instance, Dooms recalls how “commodity-focused signals developed in BlueTrend were mapped onto stock-picking opportunities” with particular success in 2015. Forecasts of lower oil prices led to sector tilts: they were bad news for oil producers and oil services firms, and good news for airlines. The bearish oil price forecast led to relative value positioning within the energy sector: shorting those producers such as Canadian oil sands and US shale gas producers that face much higher costs than Middle Eastern, Russian and Venezuelan producers, while going long of the lower cost producers. Signals drawn from BlueTrend are examples of traditional, technical inputs, which also include share prices and trading volumes. Stock loan inventory data, which can indicate how heavily shorted a stock is and what it costs to borrow and short, is also closely monitored. BlueMatrix is a big consumer of fundamental accounting data, which requires substantial ‘cleaning’ to iron out differences in accounting standards and policies. “Accounting data can be used to estimate the quality of earnings, based on measures such as accruals, debt, and research and development spending,” Dooms explains. More innovative signals entail using abundant data to gauge retail investor interest in stocks. “A lot of big data work was needed to combine information from multiple sources to form a view on retail participation,” reveals Dooms. ‘Stocks du jour’ that populate internet chat rooms can become inefficiently priced and in academia retail traders are classified as ‘noise’ traders. Though the Twitter hedge fund may have been short-lived, BlueMatrix is monitoring social media in more diverse ways, to identify stocks with substantial retail participation that are more prone to over-shooting or under-shooting fundamental values. Other internet indicators of retail fever can include clicks on Wikipedia, blog statistics from Bloomberg and readership of news articles. BlueMatrix makes use of Ravenpack to help interpret news and sentiment. Insights from behavioural finance inform other innovative signals. Retail and institutional investors can be susceptible to biases such as investors’ tendency to over-react, and categorisation biases. One example of this is post-earnings announcement drift: another anomaly whereby “positive earnings surprises can generate a swift rally that carries on for a while as different investors digest the information at different times,” Dooms points out. The examples above only scratch the surface of BlueMatrix’s alpha library. Altogether, BlueMatrix is in early 2016 drawing upon 85 sub-signals from as many as 15 alpha families. But the signals may not all be actioned at all times. 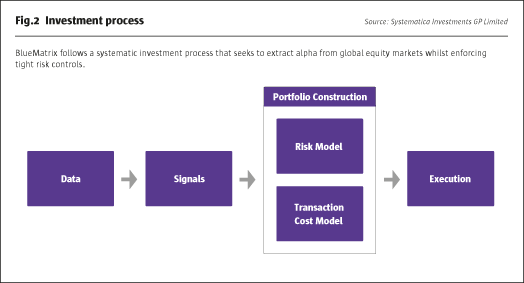 Signals must first be combined with risk and transaction cost models, and fed into the portfolio construction optimiser, before some of them get executed (as shown on the flow chart below). “Execution quality is monitored daily so any changes in conditions or costs feed back into the model, to optimise the balance between the opportunity set that the alphas present and the risks and cost of implementation that we face,” adds Dooms. Then the operations and trading teams monitor the health of models daily to check that the model is behaving in line with expectations. BlueMatrix typically rebalances 2-3% of the book per trading day, though turnover varies with costs and volatility. This implies the whole book could turn over roughly every 30 days, or eight times per year. Dooms estimates transactions costs at around 2-3% per year, including commissions and bid offer spreads. Any eventual MIFID II unbundling of research and commission seems pretty irrelevant to most systematic hedge funds and Systematica is no exception. The firm does not use trading commissions to pay for research so has no need to separate the two. The BlueMatrix strategy runs $1.5 billion across offshore funds as well as UCITS and customised mandates. Systematica is among a number of systematic managers that have set up their own legal structures for UCITS to avoid extra platform fees and costs (for managers or investors or both). The UCITS is an Ireland umbrella, converted to an ICAV structure for tax efficiency reasons. BlueMatrix is highly liquid – and will not own more than one day of average volumes or 1% of the market capitalisation of a company –with portfolio liquidity well inside fund liquidity. Accordingly, BlueMatrix UCITS offers weekly dealing. Launched in June 2015, the UCITS had already raised $270 million in January 2016, “with strong support from new market segments like insurers in Italy, Germany and Sweden,” explains Ryan. The UCITS is so far passported into around 12 countries including the major European markets. In December 2015, BlueMatrix launched a fund of one for a large pension fund. This has been modified to accommodate certain portfolio constraints including Environmental, Social and Governance (ESG) limits. “We are very versatile so it is possible to adapt to needs in a very precise way,” claims Dooms. He explains: “The scale and complexity of trading requires computers to handle the analytics.” For example, BlueMatrix is researching Natural Language Processing to enhance text analytics capabilities. This is clearly a firm that aspires to define the leading edge of systematic investment.